is ensure you have the correct sitting position. 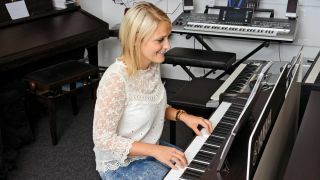 Posture is very important for piano players, as it ensures you have the maximum level of flexibility to reach all the keys, and it also helps you learn the proper technique for striking the keys. On the path to perfect posture, one of the major things you’ll need is a proper seat. If you’re slumped down below the piano you’ll struggle to learn the basics, while if you’re propped high in the air you won’t be able to hit the keys properly. You don’t need anything really expensive; the best thing to have is an adjustable seat, but you can also just use pillows and cushions to alter your height. But don’t be fooled into thinking that you’ll have to keep a rigid position as you play the piano. The guide to perfect posture is to have a position that is not only comfortable and effective, but one that allows a degree of flexibility while playing. A good piano player doesn’t just use their hands; they swivel their hips and move their body to make sure their playing style is at its optimum. Here, we’ll talk you through the steps to achieving the perfect posture so that, when you eventually come to sit down in front of a piano, you’ll be ready to learn the basics. When sitting at the piano you want your elbow and arm to fall freely from your shoulder. Your forearm should be parallel to the floor, and your arm should be at an angle slightly more than a right angle. Adjust your seat to get the right height. Make sure you’re sitting far enough forward on your seat so that you can move your torso, but back enough to feel stable. Your elbows should be slightly in front of your torso when your hands are on the keys. Your hands should be forming an arc at the keys. Your fingers need to be almost pointing down and not striking the keys flatly, while your wrists should be in line with the rest of your arm. Adjust your seat if you need to. If you’ve followed the previous steps, you should now be in the right position. It may feel a bit odd but you will get used to it. Place your thumbs on the same note (we chose Middle C) and make sure you feel natural. The arms should almost be forming a right angle. Your upper arm should fall freely from your shoulder, while your forearm should be parallel to the floor. Beginners often like to flatten their wrists as it feels more comfortable. Try not to do this; your wrists should be in line with your arm. A tendency of beginners is to immediately slump at the piano as it feels more comfortable. While you might prefer this at first, in the long run it will hinder your piano playing. Try your best to keep yourself in the correct position. As in the picture, ensure that your hands form an arc over the piano. This will enable your fingers to be precise when striking the keys. Sit far enough forward on your seat that you can move your hips, but not so far forward that you’re falling off. Be both flexible and stable. Make sure your chair is stationary. If it is too low, use hard cushions and pillows to prop yourself up. Sit forward to keep your back straight. A major benefit of a stool or bench is that you can’t lean back. Use pillows or cushions to raise yourself if you are too low. An adjustable stool is perfect for playing the piano. You can alter the height and you’ll also be able to keep your back straight and your hips flexible.